This is a prime example of my kitchen experimentation I’ve had pork chops before, and knew what I wanted them to taste like, so I played in the kitchen one Sunday afternoon and these pork chops turned out like heaven! Preheat the oven to 375º. Lightly coat an 8×6 baking pan with baking spray. Cut apple into 1/8” thick slices and toss apples with cinnamon and sugar. Place half the apples on the bottom of the baking pan. Drop pieces of butter on the apples (1 TBS). Lay the pork chops on top. 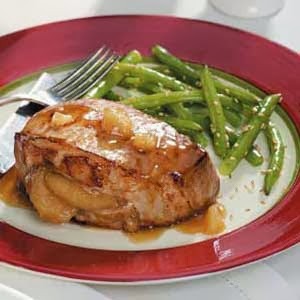 Place the remaining apples and butter pieces on top of the pork chops. Cover with foil. Bake for 40 minutes, then remove foil and bake for 20 minutes, or until the pork chops are slightly browned. Good with Moms Pear Butter (recipe coming son).